Browse: Home / Can Venezuela and its neighbours survive the coming war? –> First of all, the destruction of symbols of the modern state, by attacking the statues and museums dedicated to Hugo Chávez. This should not cause any victims, but would destabilise the mental representations of the population. Then the supply of arms and remuneration for the combatants in order to organise demonstrations which will degenerate. –> The Press will supply – after the fact – unverifiable explanations of the crimes blamed on the government and against which allegedly peaceful demonstrators had allegedly revolted. It is important that the police believe that they had been the targets of shots fired from the crowd, and that the crowd believe that they had been the targets of shots fired by the police, because the aim of the operation is to sow division. –> The third stage will be to organise bloody attacks all over the country. Very few men will be necessary to implement this stage, it will suffice that two or three teams move around the region. –> It will only be at this point that it will become useful to send in foreign mercenaries. During the last war, the United States sent at least 130,000 foreigners to Iraq and Syria, to which were added 120,000 local combatants. These armies were numerous, but poorly taught and trained. 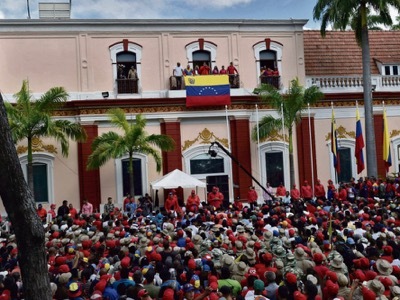 –> Already, on the initiative of General Jacinto Perez Arcay and the President of the Constituent Assembly, Diosdado Cabello, the senior officers of the Venezuelan armies are studying new forms of combat (4th generation warfare). But military delegations will have to visit Syria to see for themselves how the events occurred. This is very important, since these wars are unlike any previous conflicts. For example, in Damascus, the major part of the city is intact, as if nothing had happened, but several neighbourhoods are totally devastated, like Stalingrad after the Nazi invasion. This supposes the use of particular combat techniques. –> It is essential to establish the national union of all patriots. The President must become the ally of his opposition, and include certain of its leaders in his government. The problem is not to know whether or not we appreciate President Maduro – it is essential to fight under his command to save the country. –> The army must form a popular militia. There is already such a force in Venezuela, numbering close to two million men, but they are mostly untrained. On principle, military men do not like to hand guns to civilians, but only civilians are capable of defending their own neighbourhood, since they know the area and everyone who lives there. –> Major work must be done to secure state, army and hospital buildings.